Inventory on the Half Moon Bay – Coastside in 2013 started low, quickly rose over the summer and started to retreat during the Holidays – with wild rides and slow crawls along the way. The number of Coastside homes for sale on the MLS is low now at approximately 48. Look more closely at what has happened this year along with the five-year perspective. 2013 started strong on the Coastside following an active 2012. Spring was the strongest season the Coastside has seen since the peak of 2005-2006. In my opinion, as a result of this upward sales price trend and the long-anticipated opening of the Devil’s Slide Tunnels in March, some sellers felt that the time was right to enter the market. Those large numbers of new and – in some cases – re-emerging homes for sale led to a more balanced, or even abundant inventory at times. Balanced means that more negotiations took place, some transactions fell through, and some homes took longer than expected to sell, if they sold at all this year. By late November, some sellers took their properties off the market. In general the 2013 Coastside real estate market remained strong, yet volatile at times, and continues strong as we head into 2014. 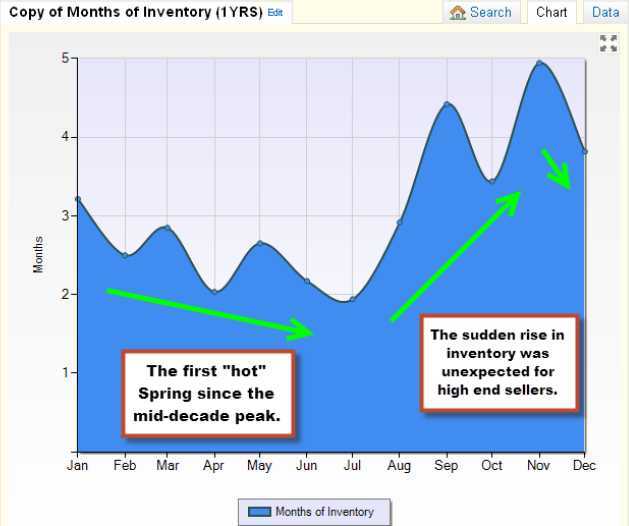 The three-year history illustrates the recurring 2013 news headline you may have read – “low inventory”. You can see the “hot” Spring 2013 market along the red dotted line in the graph below. In my opinion, the reason for our crazy spring market is because buyers noted that this was the first Spring following a full year post-recession and some were exploring the Coastside when they found they could not get what they wanted (in some cases fast enough) on the Peninsula. Some call this the “spill-over effect”. 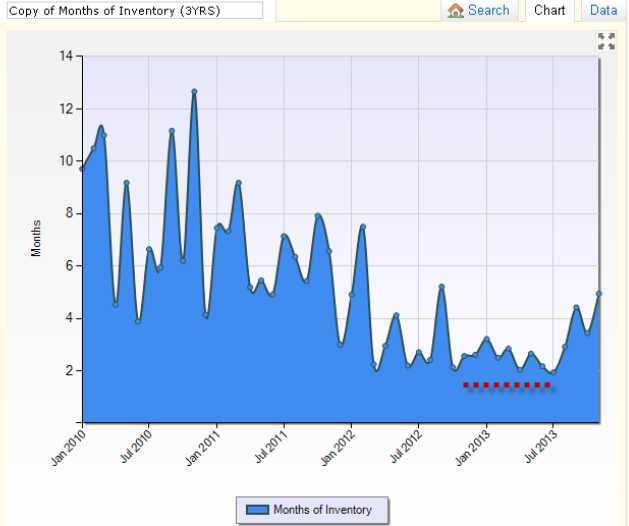 The five-year history for the Coastside shows that inventory is relatively low overall. 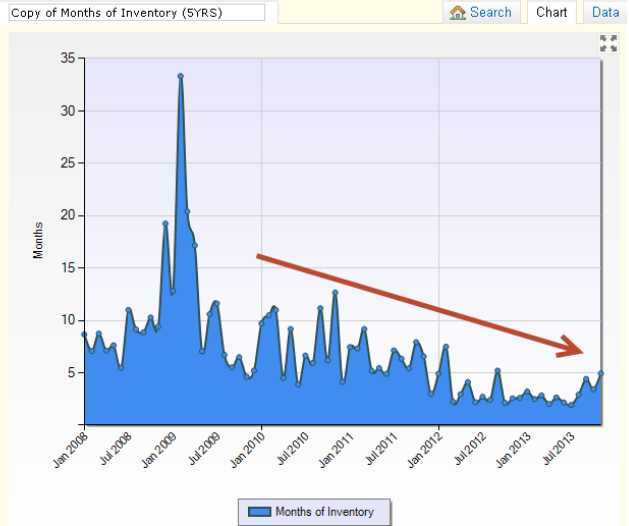 You can see that compared to the recession years, inventory is still very low. The spike in the First Quarter of 2009 follows the financial crash of September 2008. The local market was extremely limited and slowly improved as borrower qualifications gradually loosened, loan products became available again, the job market improved, and perception of a healthier economy took hold. The Coastside is generally a balanced market right now – fluctuating between buyer and seller advantages depending on several factors (e.g. current competition in the neighborhood, competition in the price point, competition in the style of home, time of year, purchase loan rates, pricing/presentation/condition). A south coast property that has been on the market 4 times without selling since 2005 and sold this year. A downtown Half Moon Bay property was listed 3 times without selling since 2007 and sold this year. A Montara property was listed 3 times without selling since 2011 and sold this year. The high end Carnoustie (Ocean Colony) properties are selling; price ranges $1.4 Million to $1.8 Million. A 30+ acre parcel in Half Moon Bay had been on the market since 2009 without selling and sold this year. An Oceanfront property was on the market less than a week and sold for 33% over asking price. A downtown Half Moon Bay property was listed 3 times since 2011 without selling and sold this year. A Moss Beach ocean view home sold in less than a week for sold for 8% over asking price. Here is what is available now! (Pacifica, Central Coastside, South Coast single family homes). Or visit “MLS Search“.